To improve the functionality of each character in Stranger Things: The Game, it’s important to know how to get all character upgrades. There are a variety of character upgrades that can help you progress through the game by boosting each of your character’s stats. For example, one character upgrade increases Dustin’s Pudding Capacity, while another increases Mike’s Stun Duration. To make it easier to progress in Stranger Things: The Game, read on to find out how to get all character upgrades! Below, we'll walk you through the process of unlocking all character upgrades in Stranger Things: The Game. Aluminum Bat: To get the Aluminum Bat character upgrade in Stranger Things: The Game, you’ll need to purchase it at the Shop for 250 Coins. Once you have the Aluminum Bat character upgrade, give it to Nancy to increase her Damage Attack +2. Canadian Tuxedo: To get the Canadian Tuxedo character upgrade in Stranger Things: The Game, head to the Librarian’s home (make sure you have Will in your party). Behind the Librarian's home, the Canadian Tuxedo character upgrade can be found in the trash. Give the Canadian Tuxedo character upgrade to Hopper to increase his Damage +1 and Charge Range at Full Health +1. Camo Backpack #1: To get the first Camo Backpack character upgrade in Stranger Things: The Game, you’ll need to find the UV Filter (inside the Forest Maze Dungeon) and give it to Jonathan. The Camo Backpack #1 character upgrade expands Lucas’ backpack to hold +25 Ammo. Camo Backpack #2: To get the second Camo Backpack character upgrade in Stranger Things: The Game, you’ll need to collect 3 Gnomes, then head to Phil Larsen's House (with four chests inside). Open the first chest to obtain the Camo Backpack #2 character upgrade. The Camo Backpack #2 character upgrade expands Lucas’ backpack to hold +75 Ammo. Camo Backpack #3: To get the third Camo Backpack character upgrade in Stranger Things: The Game, you’ll need to find the Lab Blueprints and then give them over to Callahan at the Police Station. The Camo Backpack #3 character upgrade expands Lucas’ backpack to hold +100 Ammo (max capacity). D-Cell Flashlight: To get the D-Cell Flashlight character upgrade in Stranger Things: The Game, you’ll need to collect 6 Gnomes, then head to Phil Larsen's House (with the four chests inside). Open the second chest to get the D-Cell Flashlight character upgrade. With the D-Cell Flashlight character upgrade, you’ll be able to double Mike’s Stun Duration. Lunchbox: To get the Lunchbox character upgrade in Stranger Things: The Game, you’ll need to find 12 Gnomes, then head to Phil Larsen's House (with four chests inside). Open the fourth chest to get the Lunchbox character upgrade. With the Lunchbox character upgrade, you’ll be able to give Dustin +50 Pudding Capacity. Lucky D20: To Get the Lucky D20 character upgrade in Stranger Things: The Game, you’ll need to find 9 Gnomes, then head to Phil Larsen's House (with four chests inside). Open the third chest to get the Lucky D20 character upgrade. With the Lucky D20 character upgrade, you’ll be able to give Will +5 Critical Strike Damage. Spiked Bat: To get the Spiked Bat character upgrade in Stranger Things: The Game, you’ll need to find the Nails (located in the Cemetary, need to have both Will and Nancy in your party). Next, track down Steve and give him the Nails. In exchange for the Nails, Steve will give you the Spiked Bat character upgrade. With the Spiked Bat character upgrade, you’ll be able to give Nancy +3 Damage Attack. Hockey Mask: To get the Hockey Mask character upgrade in Stranger Things: The Game, head to the house to the right of the elementary school, the one with the blue car parked out front. Break through the bushes and enter the lower left room to find the Hockey Mask, which gives Max +1 damage. 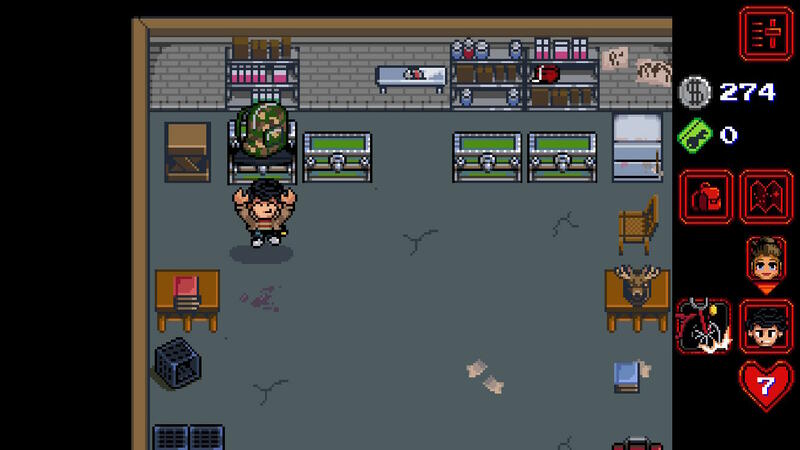 Maple Syrup: To get the Maple Syrup in Stranger Things: The Game, return to Hawkins Middle School and head to the gym (the last room before the boss fight). Switch over to Eleven, then hop into the pool. This takes her to a room containing the Maple Syrup character upgrade, which gives Eleven a +1 damage bonus. There you have it, a look at how to get all character upgrades in Stranger Things: The Game. Using these character upgrades, you’ll be able to vastly improve the survivability of your characters. Need help finding other items in Stranger Things: The Game? We’ve got you covered! Click here to learn where you can find all Gnomes in Stranger Things: The Game, and click here to learn where you can find all VHS Tapes needed to unlock a special Stranger Things Season 2 trailer! By reading through this guide, you should now know how to get all character upgrades in Stranger Things: The Game.